Moving is one of the five most stressful life events you can experience and no one knows this more than a child. Even a child as young as two can feel the undercurrents of change happening in the house and the feelings of stress and anxiety that go along with it. 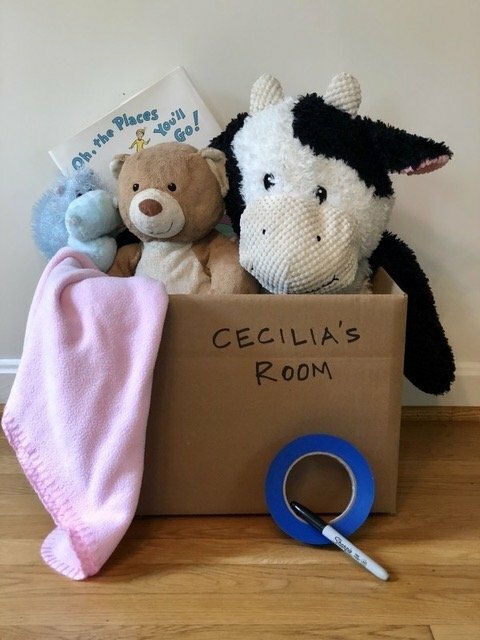 Many parents think the best way to prepare a child for a move is to shield them from its impact and wait until the child is at daycare or school to go through their things, pack up what they want, donate or throw out the rest and be done with it. This is by far the worst way to handle it. I know, because this is what I did and I paid dearly for it. We were living in Wilmette, IL – a suburb of Chicago, the first time that I moved with my girls who were 2 ½ and 1 at the time. I had no idea how to prepare them to move across the country to Washington, DC and honestly, I didn’t think it was a big deal. I was overwhelmed with all the other things on my “To Do” list and assumed a couple conversations with the kids about the big exciting move would suffice. In the week leading up to the move, I was throwing their things in boxes and both kids were losing their minds and acting out in ways I had never seen. When the 53 foot moving truck pulled up in the driveway, their entire world came crashing down. Talk about #parentfailure! Change is hard on everybody, but especially hard on kids who rely so heavily on a predictable routine and environment. In the subsequent three moves my family has made, now with three kids and one involving a messy divorce, I have learned the best thing you can do to mentally and physically prepare your kids for the move costs less than $5. With the activity comes the conversation. It’s not always easy to make the time to talk these things through with your kids when you are in the middle of managing everything else. But having these conversations, and being available physically and emotionally for them, makes a huge difference in how well they handle this incredibly hard change. If you find yourself so stressed out that you cannot calmly and slowly walk your children through the activity of sorting their room and filling their box, there is absolutely no shame in asking for help. This is something that other family members (I’m looking at you Grandma) can easily help with. The most important thing to remember is that kids, regardless of their age, need to be involved and their decisions respected. They need to participate in the planning and preparations to move. If you try and do it without them because you think it would be faster and easier, you will pay for it in other ways. My kids are now 17, 19 and 22. We are planning to move again in the spring and I’ve already bought each child their box and a roll of blue painter’s tape. Bring it on! Right at Home Radio Interview Revisit Your Listing’s Curb Appeal: Have You Done Enough?